While most companies are familiar with using structured data to make business decisions, capturing the power of unstructured data is a genuine advantage for business. Statistics clearly demonstrate that 20% of its content is structured, leaving a whopping 80% in the unstructured arena. 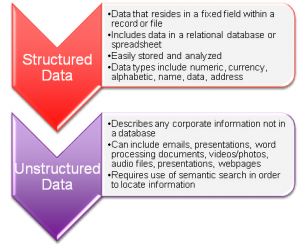 The growth of unstructured data is expected to outpace the growth of structured data. Unstructured data encompasses everything from files on shared drives to emails and messages that are part of an online conversation. These sources all contain data, which is not easily managed. The challenge then becomes how to managed unstructured data. Organizational data grows exponentially each year, typically in larger quantity than all the previous years combined! This then becomes a worsening problem, as storage of this data is creating significant expense to the organization, without an ROI. As these data stores grow at significant rates, organizations find it harder and harder to glean the information required to give them a competitive advantage. Essentially, significant data becomes buried deeper and deeper, lost in the space of their data stores, eventually becoming hopelessly lost. Organizations are becoming less intelligent with the more data they store. • Import hierarchies and classify new data into those hierarchies automatically. Go to Data Ladder to learn more about ProductMatch and download a free trial.